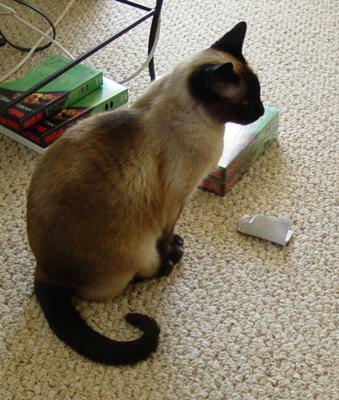 My Siamese cat, Lily (her full name was Princess Waterlily, which was fitting) came home from a business trip in my mom's pocket - my mom sold cat and dog food to breeders. Lily was the runt of the litter and small enough to fit in one of my hands. I was eight at the time, so my hands were small, too - and my parents were a bit concerned because we had two medium-sized dogs that were just wild. It didn't even take a week for her to realize she could have those dogs running from her with just a swift swipe at their noses! Lily was always the boss of the neighbourhood. She stayed so small that even when she was fully grown people would confuse her for a kitten, but she never let that get in the way of her ruling all the pets and animals in the area. No animal dared to enter our yard, and Lily would regularly patrol the blocks surrounding her kingdom to make sure everyone fell in line. When we lived in the country she even once brought home a dead bat. When she was outdoors she wouldn't cuddle or acknowledge us, she was too busy with her kingdom to pay much attention to her silly humans. That said, when she was indoors she soaked up attention and was very much a part of the family (every bit the Princess too, she had a lot of sass to her). If someone was sad or upset, she was always there to quietly cuddle until the person felt better. Every night she would do a rotation, spending a few hours sleeping in each person's bed to make sure her family was okay - until she was about fourteen anyway, when she started just sleeping in my bed the whole night through, and biting my hand if I didn't let her under the covers fast enough. She was a bit of a bed hog and would slowly push you to the edge of the bed, until she was lying in the middle of it. She was always very affectionate, even with new people (as long as her family seemed at ease with them) but she was also prone to annoyance with her silly humans and known to bite on occasion when she felt shouting wasn't working. She mellowed a bit with old age, but we were all a little worried with how she would handle my nephew when he was born; she was always a cat with little patience for anything that annoyed her. We were all surprised, though, with just how patient she was with my nephew, Yazin. From the first moment he came home she came right over and knew he was family. She would sit beside whoever was holding him, and she would sit watching him when was in his carrier or laying on the floor (attempting to learn to roll over) and wouldn't let anyone near him that wasn't up to snuff on her inspection. When he got a little more mobile, she would sit by him even when he pulled on her ears and tail; she never made a single move to bite or scratch him no matter how much she loathed the rough treatment (she would bite an adult if they were close enough for not stopping the treatment fast enough). It was the most amazing thing to watch. I always considered Lily a part of my family, all of us did, it was impossible not to as she wouldn't take no for an answer. I always felt a special bond with her; she always spent most of her time with me, which was odd because I was the only one who would tell her no to something she wanted and not cave to her whining. But seeing how good she was with Yazin, how she protected him and endured his rough handling, I couldn't help but love her even more. She died about a year after Yazin was born. Her kidneys failed and she stopped eating. We always thought she'd reach the grand old age of twenty at the very least, because she wasn't prone to letting anything get in her way. I'll always be sad that Yazin didn't get a chance to know her when he was a little older, but remembering how much Lily cared for him makes me glad she lived to meet him. I literally have a million stories about Lily; we had her with us for sixteen years and I still miss her biting my hands until I let her under the covers at night. I miss her meowing, which was horrendous because she must have been all lungs with how loud she could get (forget baby crying, she sounded like a cow dying when she wouldn't get her way). I miss her snoring sometimes when she was laying out for a nap. We were lucky though. 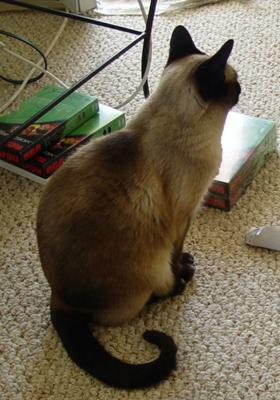 I'll never have another cat quite like her, but I can't imagine having any kind of pet aside from a Siamese, after having her. Thank you Natassia for your lovely story of Lily - a beautiful tribute to a beautiful cat. Lily sounds typically Siamese - all that you said about her rings very true and I'm sure all Siamese cat owners would recognize many of her character traits! It's great that you have so many happy memories and I hope one day you'll have another Siamese cat in your life. Your post made me recall Queenie! Among the cats Chippercat and I rehomed was Princess, who, after we socialized her, was adopted as first cat to a family with three little boys. Queenie kept order on the driveway and would let no other animal near 'her kiddens' and when grandmother babysat she would not let her near the baby, lacking a 'proper introduction'. Even though she was calico she had bright blue eyes a loud voice and a full clip of PURRsonality. Twyla, home alone with kids answered the door, a man wanting work or money. Twyla said she had no work and no money and Queenie blew up growling. Man made a move - getting 12 pounds of wrath. After that Twyla had no concerns, as Queenie was on guard. On family vacations she stayed with grandmother who adored all the cat stories the boys told, not really believing them. Her husband had ALS and was in home care and Queenie adopted him, chasing off a home health aid who was in her opinion too rough. Grandpa loved Queenie. After vacation Queenie would run the four blocks and check on him, and when he died, Queenie was there. Queenie slowed down about 10 and after checks was found to have cancer. After a two year struggle she died peacefully with her people all holding her. Princess Waterlily reminds me so much of my precious Jerusalem, AKA JJ. He too was very tiny and looked like a kitten all his life but he had the spirit of a lion. No cat could come in if he was on patrol. 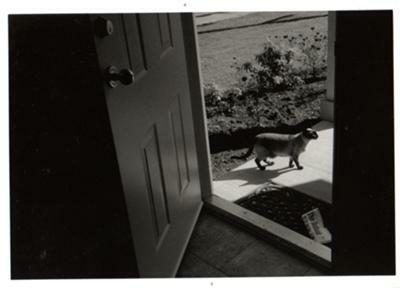 In the evening, he had to patrol his yard or he was unhappy, VERY LOUD, and restless. He was my beautiful boy. I knew that if anyone tried to attack me, he would go for their jugular as was evident when a stranger he didn't know came into the yard. He growled and bared his teeth, yet was the most loving cat to everyone he knew or that I approved of. He died of cancer two years ago. I miss that small guy with a lion spirit. I have other Siamese but he will always be very precious. I know how you feel too. My Lily was exactly the same. She died, under euthanasia at 15 due to kidney failure; her one year older brother, Thai, died under the same circumstances, the year before. My new baby Su-Li, comes to me mid-February.